Will the Saved Go To Heaven? 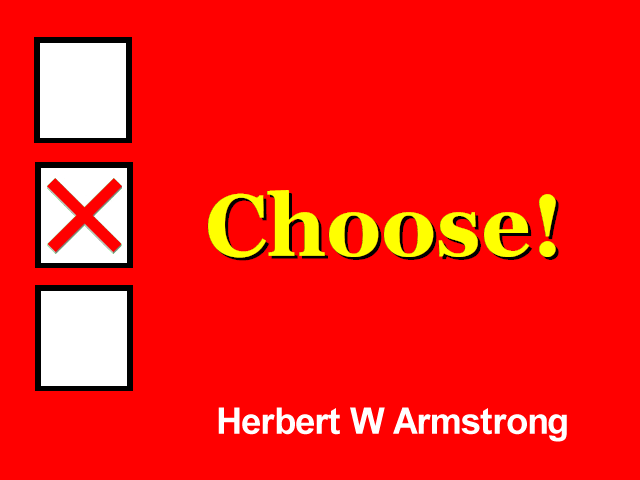 And greetings friends, this is Herbert W. Armstrong; with the GOOD NEWS of THE WORLD TOMORROW! Your Bible does foretell World War III! Yes definitely, but it does not contain any prophecy of such a war now, in the immediate future between our Western world and Russia. Let me repeat that again — Bible prophecy does not contain any prophecy of any immediate war now between the United States and the Western world and Russia — it DOES contain a prophecy of another war that we're going to get into first and one that is going to come from the least expected quarters. World trouble IS prophesied. Yes, the most colossal, the most catastrophic world trouble in the World War III which is coming that this world has ever lived through. World war and world trouble so cataclysmic, that unless God Almighty intervenes to stop it, all human life would be blasted off this planet. The worlds greatest scientists tell us that. Jesus Christ told us that nineteen hundred years ago, and when He foretold this very time of trouble, into which we are now emerging, He said, "that unless those days should be shortened, there should no flesh be left alive... no human life left alive on this earth, but He said, for the elect sake those days shall be shortened." God Almighty will intervene, God will stop it. God will save us from ourselves. God will intervene and let me tell you my friends, the biggest news ever recorded in history or in future history — which is prophecy — IS the news, the GOOD NEWS of the WORLD TOMORROW. That's the purpose of this program, to bring to you that GOOD NEWS. I wonder if you realize that was the gospel of Jesus Christ. Jesus Christ came from God, bearing a message from God Almighty to man. Men rejected Jesus Christ they crucified Him. But He did have His own followers, He did leave His disciples who became apostles. They did go about preaching the name of Jesus Christ and preaching His message. And there were converts and people by the hundreds, and the hundreds and even by the thousands were added to the church who believed that gospel and who believed ON Jesus Christ, but after one or two generations, (I wonder if you know the history of what happened), then they began to reject that message. But they did continue to accept the man and to accept His name, but gradually they even began to believe in a different Jesus Christ, that is, they represented Christ as a different kind of a man than He really was. They twisted His message. His message finally became buried under a rubbish heap of pagan superstition and tradition! And so my friends, why is it when I come today with, the "good news" of the World Tomorrow — the Kingdom of God — which is the good news of coming world peace, the good news of prosperity for everybody, the good news of happiness in the human heart, the good news of joy, just radiating... from every human being. Everything that we want we're going to have it, and when I bring you that good news, people are absolutely stunned and they listen with absolute open astonishment. Why? Because you haven't hear it. Just as the people were astonished at Jesus' doctrine when He came preaching it nineteen hundred years ago. Now Jesus came preaching the Kingdom of God and people were astonished at that doctrine. I come preaching the Kingdom of God today, because Jesus Christ prophesied that even though men would reject that gospel and He said it is necessary to understand and BELIEVE that Gospel in order to be saved. And yet, even though every prophesy foretold apostasy — turning away from the truth — embracing fables, of the people who would have itching ears, that would assemble to themselves teachers that would say; "don't preach the truth, but preach soft and smooth things, preach deceits." People that would be turned to fables, people that would fall away from the truth; a GREAT falling away would come. That, my friends, is PROPHESY. And yet Jesus foretold that even down in these last days, just before the end, when his apostles, that is, they were still disciples — students or learners — at that time and they came to Jesus privately, as you find recorded in Matthew 24, and they asked Him... when are these things you've been talking about going to happen? What will be the sign of your coming (the second coming of Christ) back to earth, because He had told them He was going to heaven, but He told them if He went He'd come again. And they said, what will be the sign of your coming and the end of the WORLD, that is the end of this age — the end of this SYSTEM that has been built up — this society by mankind... contrary to the laws and the revealed ways of God. The end of this way — the end of this world — this age, this time, not the end of the earth's existence at all. When will these things be, when will, this end, this age, this time, this civilization come? And Jesus Christ said, that there would first be many deceiving the many, and they would come in His name — proclaiming His name was Christ — they would come in His name; that means they would claim to be even Christian. And they would use His name, but the world would become deceived. And then He said, that getting down right at the very time of the end, He said, this gospel of the Kingdom, the same gospel He preached the Kingdom of God — shall be preached — and in Mark's version He said, "published" — into ALL the world as a witness to ALL nations and THEN, He said, the end would come. Now, just before the end of the age then, this same gospel that Jesus preached — the gospel of the Kingdom of God — the gospel of the time when God intervenes, to save us from ourselves, when He cuts short these times that men with their terrible destructive weapons are bringing on themselves that God will intervene, and God will give us a government of peace. Just before that time of the end of this world and the beginning of the happy, joyful, world tomorrow, this same "good news" about that Kingdom is going to be proclaimed in ALL THE WORLD as a witness unto ALL nations. My friends, that prophecy is being fulfilled this moment in your ears, this program is now going around the world. It has not yet gone into all nations, it soon will. And the GOOD NEWS, of the Kingdom of God, is being heard, and so now you can hear this program and this good news of the coming wonderful time for all of us and you can hear it my friends, we're getting very close to the end and we need to know what is this gospel that Jesus preached, what IS the gospel of the Kingdom of God. The word Gospel means; GOOD NEWS and it's good news of God's coming Kingdom. Well, a Kingdom is a government, and so it is the government of God, not government of and by man, it is government from God over man. The government of God. You know my friends that, that is what you find in the first chapter of Genesis. Do you know you find that all the way through your Bible clear to the very last chapter of Revelation? You find the government of God, that is the message of God. And that is the message that Jesus Christ brought. The rulership of God. The sovereignty of God Almighty. That IS the message my friends, that every prophet God ever sent carried to mankind. And that is the one message that mankind is bent on rejecting. I wonder if you know that the reason they stoned the prophets of old is because they brought the message of the government of God. CRYING OUT TO MEN, to surrender their own ways, their HUMAN IDEAS and HUMAN WAYS and to return to the ways and to the laws of God Almighty. It seems that the carnal mind is not subject to the law of God neither indeed can be. But on the other hand, there is a way that seemth right unto a man, the end thereof are the ways of death. I've quoted some scriptures there, one from back in Ezekiel's prophecy, and the other from the eighth chapter of Romans, if you know where these are in your Bible. Now the Kingdom of God is government of God, but it is more than mere government, it involves more than that, because after all a government in its main sense, (in the sense in which Jesus preached it) is actually a Kingdom; a nation. And in this case it is a family grown so great that it comes into a nation. Now all the way through there is a family relationship mentioned throughout all the preaching of the Kingdom of God. In all the preaching of Jesus, in the preaching of the apostles, in the preaching of the apostle Paul. And you don't have the Kingdom of God, and it's necessary to believe it to be saved and you don't have it unless you know the four things that constitute a Kingdom. You need to know how to enter that Kingdom, because as we were seeing in the preceding program yesterday, the Kingdom of God is something that is to be seen, but flesh and blood can't see it. A mortal human eye can never see it. The Kingdom of God is something that we can enter into. But no flesh and blood mortal that is born of the flesh can enter into it, you must be BORN AGAIN before you can get into it. This time BORN of God. You've been born of man and you are man. Now you must be born of God. You must be born of the SPIRIT, and when you're born of THE SPIRIT you'll be spirit, when you're born of man you're man, you're mortal, and you're flesh, you're not spirit. Man is flesh, but God is a spirit. And now you must be born of the spirit. And the apostle Paul said, it is something that we are to inherit, but he said, flesh and blood cannot inherit the Kingdom of God. Therefore I say to you my friends, on the authority of Jesus Christ, that while mankind is so mixed up as to what the Kingdom of God is today and I outline so many of the different things that people think the Kingdom of God is in the preceding program. Some people think the Kingdom of God is actually one of the worlds empires today. Some people think the Kingdom of God is something in you, in your heart, just something set up in our hearts, yes nice wishful thinking and altruistic thoughts and some nice plateaus and things of that sort, and that's all right as far as it goes. And I want to tell you so far as that is concerned all of the right things embodied therein will have to be set up in your heart before YOU can enter into or inherent the Kingdom of God. But some people think than that the Kingdom of God is a condition that will obtain on earth if and when the church — and by the church we mean of course, all the various kinds of churches and denomination and branches and segments and divisions and all that sort of thing — when they can bring about a condition on earth of what we regard in human eyes as being a condition of perfection and a sort of utopia, than that will be the Kingdom of God, some think. Well that's all material, that's something you can see. No, the Kingdom of God, is something that mortal human eyes can't see. It's something that flesh and blood can never entered into, it's something that flesh and blood cannot inherent, you have to be MADE of the spirit until you ARE spirit, actually born of God... now when I speak about being born of God... that has something to do with salvation, hasn't it. That has something to do with grace, yes but, we have to understand it. And I want to tell you that there is nothing so misunderstood today. Herbert W. Armstrong will return in a moment; but first this offer concerning literature of related interest. Human life comes from a single pinpoint size egg cell, beginning at conception that cell grows divides and gradually develops into a small human being. The process by which the baby is delivered into the world is called birth. In speaking to a leading religious figure of his day, Christ referred to this process of human birth as an analogy to explain spiritual REBIRTH into God's family, saying, "you must be born again." Nicodemus wondered what Christ meant by the term "born again." Today's religious experience? Actually being reborn physically? Or what? Well... the Kingdom has to occupy a definite territory... because the Kingdom is ruled over by a King with laws and government. And any King's jurisdiction extends only as far as his territory extends. And pass the boundary line of that territory he has no authority, no jurisdiction. So you'll have to know where IS the Kingdom going to be. Is it going to be on earth or up in heaven. Who is the King of the Kingdom, well that's rather generally known. But what about the government? That's the thing that mankind seems to want to do away with, they DON'T want any of the laws of God, and they try to deceive themselves into believing that... Jesus did away with His Father's laws... or His Father's government. Oh... my friends, He said, "think not that I come to destroy the law or the prophets" He didn't come to destroy but to fulfill and he set us an example that we should follow His steps and James says, we have to FULFILL the law even as Jesus fulfill it... and if... we don't we commit sin. God is the sovereign ruler of this world, and God Himself has ruled; that we be made free moral agents and that we MUST choose. GOD, IS FORCING YOU, EVERY ONE OF YOU LISTENING TO MY VOICE, TO CHOOSE; right or wrong, life or death. Obedience to God or disobedience and DEATH.!! Let me read it to you it's back here in the very thirtieth chapter of Deuteronomy... oh yes... it was one of the very first books written in your Bible, by the very first man inspired to write some of the Bible; Moses. And here it is, God says in verse 15 Deuteronomy 30, see, I have set before thee this day life and good, death and evil in that I COMMAND thee, THERE is the great sovereign ruler commanding; God is giving the orders! God isn't leaving it to man to do as he pleases! God is giving the orders and God says in that I COMMAND THEE THIS DAY, to love the Eternal thy God; to walk in His ways, His commandments. Yes but, He allows us to do something. What does He allow us to do?... to disobey. But my friends, He forces you to choose; whether you will OBEY His COMMAND and love GOD and obey His commandments as He says here, I COMMAND thee this day to love the Eternal thy God to walk in His ways — which certainly are not the ways of human beings, and not the ways of this world as it is set up today — and to keep His commandments and His statutes and His judgments that thou mayest live and multiply. Why does He wants us to obey Him? Is He a God like Herbert Spencer dreamed up? A egotistical God that wants us to flatter Him and please His vanity or else He's going to become angry like... the lowest of humanity... and huh, vent His temper on us and His anger and His hatred for us try to destroy us... OHhhh no, my friends, God wants us to obey Him and love Him because, my friends, when we do we're happy. Because it goes well with us, because its an inexorable law and it works just like the laws of gravity, the laws of physics, the laws of chemistry. He said, I command thee to love God to walk in His ways, keep His commandments His statutes. Why?... that thou mayest live and multiply, and the Eternal thy God shall bless thee in the land whither thou goest to possess it, but... He says, but, if thine heart turn away, so that thou wilt not hear, but shalt be drawn away... now if you turn away... that means He does allow us to do that, and He has made us chose. You know my friends... some people don't believe there is any real devil... well I will say this... regardless of what you believe about that, of course what you believe doesn't affect the truth. But nevertheless, I will tell you this; there is no devil with enough power to force you to either obey are disobey God. I will tell you that there is no preacher that has power, there is no church on this earth that has the POWER to FORCE YOU to either to be saved or lost! There is no power, no organization; no man no devil. And there is no myriad of demons with enough power to force YOU to decide the wrong way or the right way. They cannot force you to obey God. God will not, and no power can, they can not force you to disobey. You yourself are a free moral agent and God has made you so! God has endowed you with free moral agency, Oh yes, God is the ruler, God is the one who is calling the tune... God is the one who has set it so and you're powerless to change it. The devil is powerless to change it, ALL the demons, and ALL the angels are powerless to change it. Every church and every power, and every pressure group and every organization of man and every preacher on the earth is POWERLESS to change it! God is the sovereign ruler. Now, there are laws, you're going to have to choose every one of you. Now, if you neglect so great salvation, as God has offered you, you are choosing, you are choosing the wrong way and you are sentencing yourself to death!... the penalty of sin. YOU HAVE TO CHOOSE LIFE... and do it of your own will, voluntarily. Your own volition, your own FREE WILL, or you can never have salvation. No one can talk you into it, no salesman, no preacher... I don't care how much he loves you, or how much he desires to see you saved, he can't do it. You know long ago I learned that, and I've quit trying to talk people into it, I just preached the truth. I want to tell you, my friends, your whole relationship with God is a private personal relationship between you and God!! Now, I do not say for a minute that we are not influenced by circumstances, I fully understand that God can bring about circumstances that will bring us to a place where we look on things differently and where perhaps we're going to choose the right way and be willing to do it, but still God doesn't force you. No, He's going to force you one way and that's all and that is to make your own decision?. Now,... God says in verse nineteen?... well, let's go back to verse seventeen just a moment first, but if thine heart turn away so that thou wilt not hear — you see God allows us to turn away, He allows us to rebel, when He says, "IF", — if He was forcing us to be saved, if He was forcing us to obey Him — He couldn't say, " if " you do the other, so that wilt not hear but shalt be drawn away, and worship other gods, and serve them; I denounce unto you this day, that ye shall surely PERISH! THERE IT IS. You are going to decide what is the outcome of YOUR life and your destiny. Are you going to inherit eternal life as God's gift? Or are you going to perish? Are you going to die: the wages of sin is death, it isn't eternal life, the wages of sin is death! Now God says again in verse nineteen: I CALL HEAVEN AND EARTH TO RECORD THIS DAY AGAINST YOU, THAT I, GOD ALMIGHTY, THE RULER, HAVE SET BEFORE YOU LIFE AND DEATH, BLESSING AND CURSING, THEREFORE CHOOSE... God says, we have to choose and that's an order. And God's going to make you choose, and even if you try not to choose and neglect, you are choosing automatically. You're choosing DEATH, you're choosing to PERISH. You're choosing the penalty. But you can choose life, it's up to you. Now, God is the great ruler; He said here, I have set before you life and death, blessing and cursing, therefore CHOOSE life. What does He want us to choose.. life. He even commands you to choose life, but He allows you to disobey. Now, He forces you to choose, He allows you to disobey. I think we better get these words between what God forces and what He allows straighten out — I really had to get it straighten out in my own mind here a little bit, and I want to make it plain to all of you listening in. Now He wants you to choose life that thou and thy seed may live: that thou mayest love the Lord thy God, and that thou mayest OBEY his voice, and that thou mayest cleave unto him: for he is thy life. Ohhh, I tell you that's wonderful when you come to see it. You know I'm glad that God has made us, free moral agents, and that God has decreed, with his SOVEREIGN rulership, that we have to make the decision. God will not make it for you, you must make it for yourself. Now the Kingdom of God is a family, if you choose life my friends, you'll first be begotten of God and later your going to be born of God. And it is THOSE that are BORN of God that become His family SO great that... at first it's going to fill the land of Palestine, now the territory is given in your Bible. And the boundary limits at first going to be from the Euphrates River on over to the Nile river in Africa and in the land of Palestine but it's going to expand from there — because the Kingdom of God as Jesus said, is like the grain of mustard seed it starts out very small, the smallest of all, actually the Kingdom of God has started out with one man, the first born of many brethren. The first begotten, the first BORN of the dead, Jesus Christ. Oh, one man the smallest you can start with. And, its going to expand from the territory I just outlined, because if we're Christ's, we're Abraham's children and heirs according to the promise and the promise given to Abraham was that exact territory and boundary line, but other prophesies show its going to expand from there. It's going to grow until it fills the WHOLE EARTH! That's going to be the territory. And nowhere in your Bible does it say the territory will be heaven, it says it will be this earth. Now that's one thing you have to know, if you're going to believe the Kingdom of God — and you have to believe that good news in order to be saved. Oh there's so much we need to know. Now I've shown you that the apostle Paul said, if you preach any other gospel than that, that he preached you're under a curse and it's a double curse. What gospel did Paul preach, did he say anything about grace? People say today, well, you preach the gospel of the Kingdom — the Kingdom of God-what about the gospel of grace? Well listen my friends, grace is not a gospel in itself, it's part of the good news of the Kingdom of God. It's only through grace you can ever enter into that Kingdom. You know; it includes grace, grace is included, that's part of it. What about salvation? Well, what is grace, it leads to salvation doesn't it? When you learn what salvation is, actually salvation is YOUR being BORN INTO the Kingdom of God. That's what it is, and you have to know what the Kingdom is to understand salvation. Why certainly it includes salvation, why certainly it includes grace, but if you just preach what you think is grace alone and you leave out a lot of the things of the Kingdom you're not preaching the full WHOLE GOSPEL!! You're only preaching a part of it! That my friends, is what a lot of you have been believing. Now Isaiah tells ya how you can be born into that Kingdom. In Isaiah 55:6-7... seek ye the Eternal... oh, you have to seek, now do you know, that Jesus said, "I tell you that many shall seek to enter into the Kingdom of God, many will STRIVE to enter into the Kingdom of God and shall not be able. Have you ever read another scripture in your bible in the New Testament where we are told to work out our own salvation with fear and trembling? Now, listen does that mean that YOU do it? Does that mean you don't need any grace? Not at all. I tell you my friends, you have to put your own seeking you have to put your own HUNGERING and THIRSTING and your desire and your surrender and your obedience and some of those things along with what God gives you. Now, everything that is going to save you comes from God. Jesus Christ paid the penalty of your sins, you can't and you didn't. You can't lift yourself up by your own bootstraps. God sends you His Holy Spirit that impregnates you with His life you can't give it to yourself, there is NO eternal immortal life within you, you have no life inherent within you except an existence that comes by the breath of the air you breathe... and by the blood that circulates in your veins that is nourished by the food and the water you eat and drink. You cannot give yourself any life beyond that, that comes from God, but the thing is there are terms and conditions and God WILL NOT give you His grace, He WILL NOT give you His Spirit, He WILL NOT give you eternal life, He WILL NOT SAVE YOU, and He saves you. He will not do it by faith through grace, UNLESS and UNTIL YOU surrender. Unless and until you perform the conditions which are: repentance and obedience and faith. And you'll have to supply those things as terms and conditions. Yes, Isaiah says, "SEEK the Eternal WHILE He may be found,... how?... let the wicked forsake his, his own way, and the unrighteous man HIS THOUGHTS and let him return unto God and find God's ways, God's thoughts and walk in His paths and keep HIS commandments. It is the government of God, my friends. God will not save any soul He does not govern. Is He governing YOU? Or are you governing yourself? Are you going the way that seems right in your eyes or are you yielding to your own impulses your own will or have you surrendered and let God govern you, are you SEARCHING the Bible, to live by every word of it. Do YOU realize it is the authority SUPREME over your life; there's the question. Listen my friends, write in for our booklet on; SAVING FAITH. The booklet on SAVING FAITH. What kind of faith is necessary for salvation. No there's no charge. Send your request... So this is Herbert W. Armstrong saying, good-bye friends.